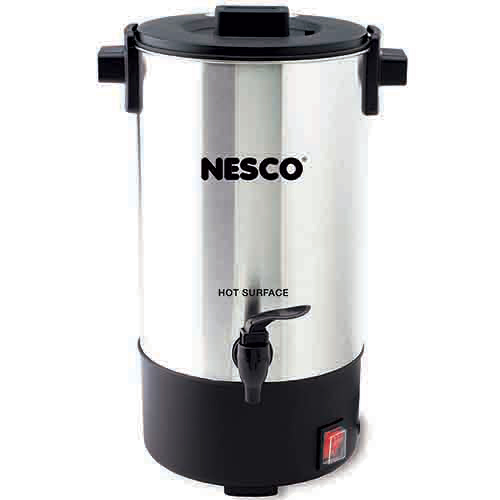 The NESCO CU-50 is a Coffee Urn, constructed of a stainless steel body with an easy to use dispenser and continuous pouring feature. It is perfect for parties, meetings or offices and features water level marks for easy filling. Its hefty capacity can hold up to 25-5.7 oz cups. Approximate brewing time is one cup per minute. With locking lid and stay-cool handles to help prevent mishaps, this urn is a real crowd pleaser. The Nesco Coffee Urn, 25 Cup has many exciting features for users of all types. See the Nesco Coffee Urn, 25 Cup gallery images above for more product views. 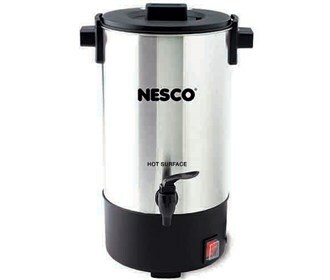 The Nesco Coffee Urn, 25 Cup is sold as a Brand New Unopened Item.